How will you know if your Giving Tuesday campaign is a success? With DonorPerfect’s reports you can analyze the impact of your Giving Tuesday fundraising efforts and plan for next year. DonorPerfect has a TON of different reports to track just about any metric you want. It’s one of the best features of the program. In this post, we’ll highlight key metrics found in the Statistical Tabulation report. What Key Metrics Are We Tracking? The Statistical Tabulation Report will show you the total amount of funds raised as a result of your Giving Tuesday campaign. This report also shows the count of donors, gifts and the average donation amount for Giving Tuesday gifts. It can be segmented according to any field you specify and show campaign performance year-over-year. In our example below, we segmented by the Solicitation code we used to track Giving Tuesday gifts each year (e.g., GT2017, GT2018). We used one single Solicitation code per year (e.g., GT2018). To track individual efforts, such as a direct mail postcard or email appeal, we set up a Sub-solicitation code (e.g, GT-CARD, GT-EMAIL, etc. ). We also used one single Campaign code (e.g., GT) for everything Giving Tuesday related regardless of the year. Gifts gained through other fundraising efforts were excluded since we filtered for gifts only collected as a result of Giving Tuesday. To get this data, we created a selection filter to select only the donations that came in for Giving Tuesday. Enter the Date Range for all GivingTuesday data that you’re tracking. We’re tracking 2017 and 2018 Giving Tuesday campaigns we so entered 1/1/2017-11/30/2018 as our date range. 3. Select any other options as desired and click Screen to see the report. NOTE: If you don’t use the same exact codes as us, that’s fine. This is for example purposes only and what’s in your system is likely to be different. For more options and additional information about this report, visit Statistical Tabulation Report in Community. You can also visit Setting Up Your Giving Tuesday Codes to see which codes we recommend using. In our example, the Statistical Tabulation report shows that the total amount of gifts for 2018’s Giving Tuesday campaign increased over the previous year’s gifts. The count of donors, number of gifts received and the average amount of Giving Tuesday donations also increased. These metrics can be used to evaluate how well your Giving Tuesday campaign performed and to make projections for next year’s goals. Using this data, you could set a conservative 2019 fundraising goal of a 20% increase or $25,200 in total Giving Tuesday donations. Digging deeper, you can also compare these results to industry standards. In 2017, organizations using DonorPerfect saw a 47% increase over the previous year’s Giving Tuesday fundraising performance. How did your nonprofit compare? How did other nonprofits in your sector do? Use these metrics to get and stay on track with your Giving Tuesday fundraising goals. Giving Tuesday is also a great way to acquire new donors and re-engage with existing ones. The Statistical Tabulation report can help you measure your donor participation rates. First, you’ll need to obtain the count of all active donors in your system. This is available via My Account > Details and Contacts in DP Community. Select the DETAILS tab. 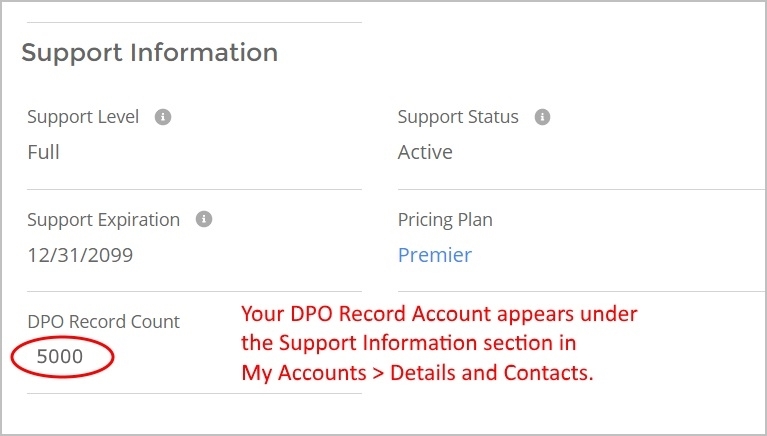 The DPO Record Count field of the Support Information section near the bottom of the screen shows your DPO Record Count. To get your donor participation rate for Giving Tuesday, simply divide the Count of Donors from the Statistical Tabulation report (e.g.,150) by the DPO Record Count (e.g., 5,000) and multiply by 100. In our example, the count of donors that participated in Giving Tuesday was 150 and we had 5000 donor records in our database, giving us a 3% donor participation rate. (150/5,000=.03 or a 3%) Did your donor participation rate increase or decrease from previous years? Did it meet your target level of participation? You can also use your donor participation rate to estimate future Giving Tuesday performance. Let’s say you gain 250 new donors in 2019 , making your donor record count 5,250. Using the same 3% donor participation rate as an estimate, you’d have 158 donors participating in Giving Tuesday next year. DonorPerfect has many other reports to measure #GivingTuesday impact. Which report(s) do you use? We’d love to know! You can share your ideas and see how others are measuring the impact of their Giving Tuesday campaigns in the Giving Tuesday Discussion group in DP Community.